First, the National Summer Tour 2017 at the Meiji Jingu Stadium. These two days, we all got through it without problems! The summer of 2017 started at the Meiji Jingu Stadium! Every year, the end of the tour is in Meiji Jingu Stadium, but this year it was the starting point, which made me think “will the sparkling summer come?”, and I felt somewhat strange. The live shows were soooo exciting! I am overflowing with a sense of accomplishment! I am happy we were able to start in the best way. 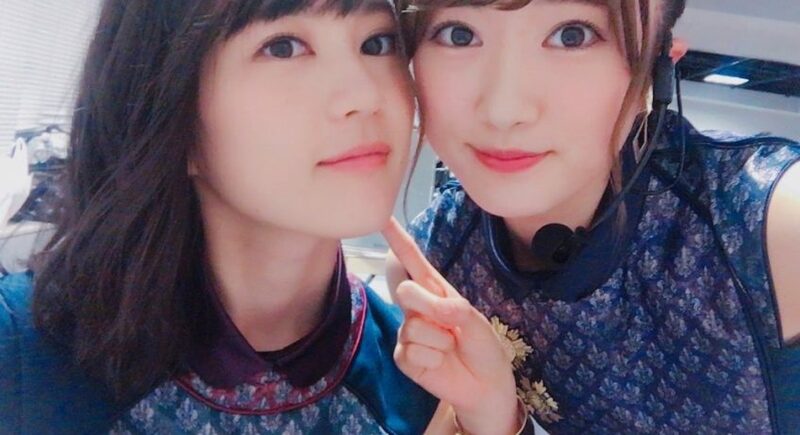 This time, the live shows are divided by generation for the first time. At first I also wondered anxiously “What will happen? 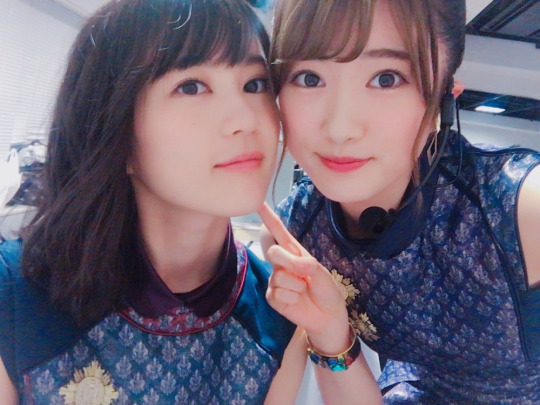 Will it be okay?”, but during the rehearsals, I felt the bond between 1st, 2nd and 3rd generations, and also that the unity of Nogizaka as a group has become bigger and bigger. Painful and sad things…as well as happy things and enjoyable things…we came to share them. it reaffirmed that our bond and love we fostered for six years didn’t change. Those words came out spontaneously. I love everyone from the 2nd and 3rd also. Of course!! After all, we are Nogizaka46. The second day, the final live shows in Tokyo Dome were also announced!! so everyone please support us. Also, all the fans that always support me, thank you so very much. I am brimming with gratitude. 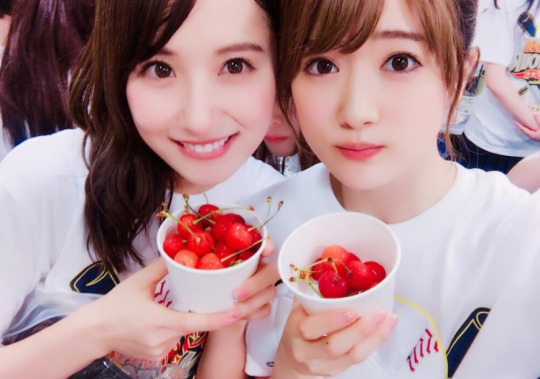 ↑After the live shows, I ate cherries with Misamisa. 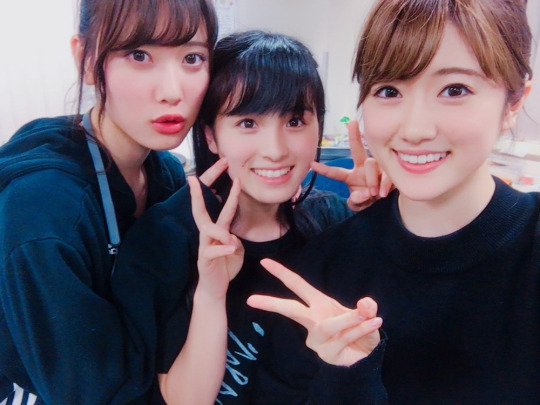 ↑1st gen Hina, 2nd gen Junna and 3rd gen Momoko. During the second day’s MC part, I had the chance to confess to Ikuchan. She also came to the Meiji Jingu Statium on the second day!! The swiftly moving Himuko!! As expected! I was happy that older brother Shitara-san also came to the venue. Lastly, the reincarnation of desire outfit. 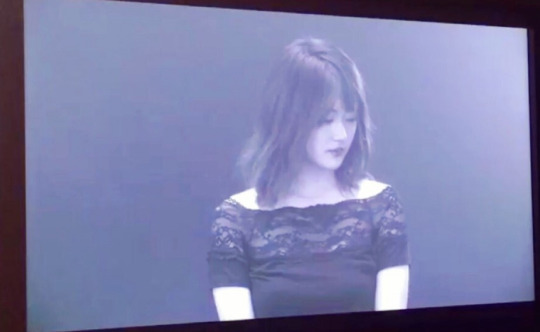 below is the footage broadcasted on a screen during the performance. This time it was limited to a video, but everyone was enthusiastic and was filmed. Everyone that comes to one of the various live venues, let’s have a great summer together! I couldn’t write about a lot of things. On the 25th of June, it was the 17th National Handshake event in Makuhari Messe. the kindness and smiling faces of everyone warmed my heart. We were also together in the dressing room. The applications for the 18th handshake event have already started. I will be there from round 1 to 5! For the handshake events, I am always thinking about wanting to change my image completely every round. I will appear in the TV anime “Irresponsible Galaxy Tylor” that starts broadcating in July! I have no experience, but because I will give my all, please be kind to me. ※Niconico Douga, Banzai Channel, and other planned distributors! but the whole cast is very nice which put me at ease. Challenging new things, I need a lot of courage and energy, but the amount of strength it gives me exceeds it by far. In order to expand on my abilities, I’ll do my best everyday!